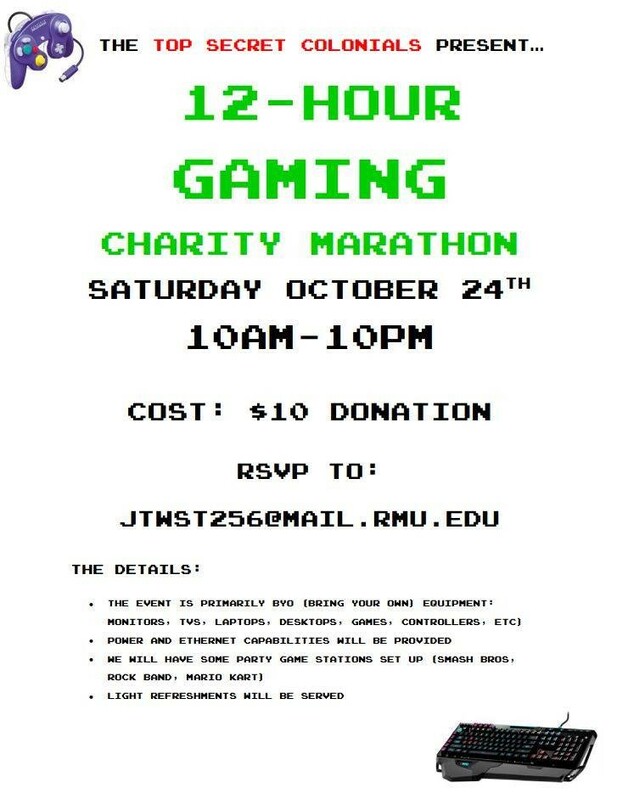 The Top Secret Colonials will be holding a 12-hour gaming charity marathon on Saturday, October 24th from 10am-10pm. A $10 donation is required to attend. The event is primarily bring-your-own equipment (monitors, TVs, laptops, desktops, games, controllers, etc.). Power and Ethernet capabilities will be provided. There will be some party game stations set up (Smash Bros, Rock Band, and Mario Kart). Please RSVP by emailing John Weingartner at jtwst256@mail.rmu.edu. This entry was posted in top secret colonials on October 15, 2015 by Caitlin Counihan.